The black and white vases have Caribbean Dream hyacinth bulbs, the bulb bowl Blue Star hyacinths and the uranium Rimac Fancy vase on the left a Delft Blue hyacinth. This is such a gloomy January I've had to use flash to photograph the hyacinths. Caribbean Dream hyacinths in the black and white vases on the left. Delft Blue in the vases at the back; Blue Star front right. fantastic blooms from this amaryllis bulb which has 2 stems: 3 large flowers on each; the bulb bowl on the right has 4 out of the 5 Splendid Cornelia bulbs in bloom; that one bulb hasn't grown - why?? This hyacinth bulb has 2 bulblets growing from it (usually it's just 1 if there're any) and 1 is so developed it's blooming. I usually remove any bulblets I notice so any energy from the bulb goes to the main flower, not developing a bulblet. In this case it's useful to make sure the shrinking bulb (all the bulbs shrink when forced) doesn't drop into the vase which has quite a large opening. The bulblets can grow and develop on their own if planted - but only if a bit of the basal plate of the bulb capable of growing roots is attached when they are removed from the parent bulb. Most of these are starting to show their pink colour. In my experience pink hyacinths are usually the first in bloom. I think the hyacinths I took out of the dark the last few days may be my final ones out before Christmas. The shoots are a bit anemic as they've been in the dark but they green up after a few days in the light. 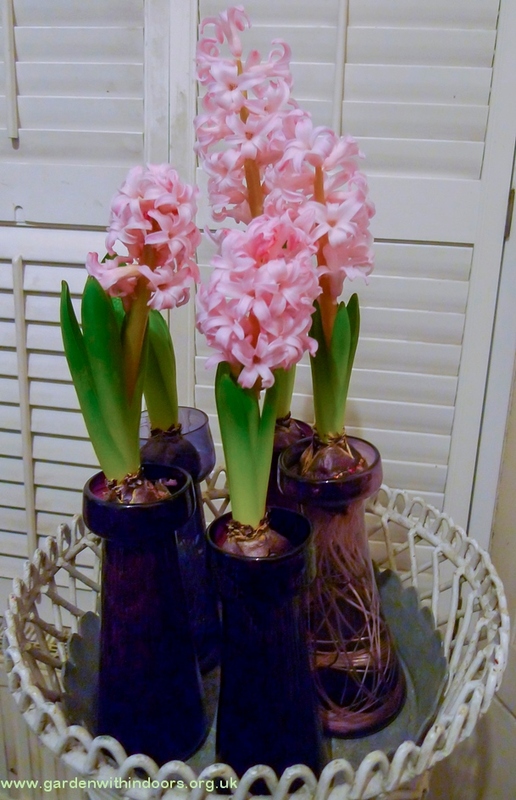 I just took this hyacinth out from the dark today (Dec 6th). It shows an ideal shape for the stem of the hyacinth when it is ready to come out of the dark. The bulge of the flower has clearly grown up out of the bulb. I saw Sainsbury's had a new hyacinth vase for sale so had to get a closer look. It's a little late to be starting hyacinth bulbs (14-11-2017) but I had to see this new product. I didn't notice the colour when it was inside the box - it's not very nice. I thought it would be quite basic and it is. Convenience is the main thing going for it. I filled it with water to just under the bulb and put it in the cellar with the rest of my hyacinth vases. I was away for a week in October and didn't have time to finish all my bulbs - quite unlike me as I usually do them immediately in September to increase my chances of Christmas flowers but this year is a bit later. Going to Korea for my son's wedding took priority. I have 10 hyacinth bulbs left. 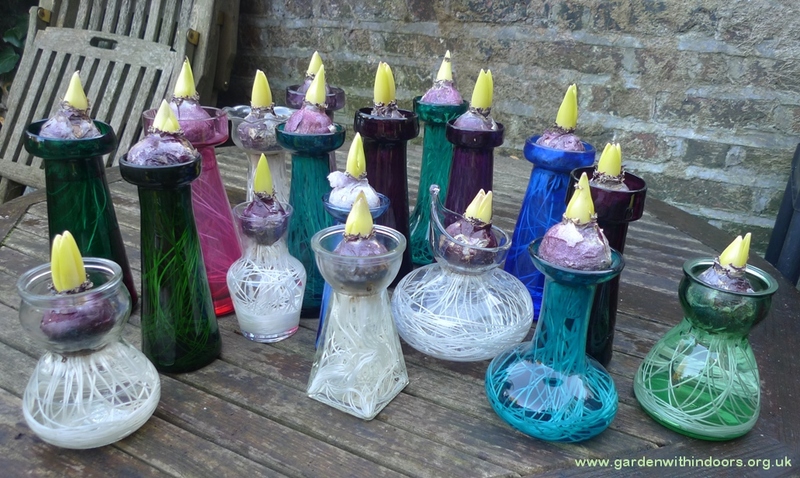 I do have at least 1 more vase but no more bulbs. If I have time I'll pop down to the garden centre and see if they have any more bulbs. I know Sainsburys is out of stock. Of course, when I was in Korea I wanted to see if they sold hyacinth bulbs. Some spent dried bulbs in a basket outside this flower shop/cafe was the closest I could find. At one point they had hyacinth bulbs in Seoul - intrigued to find out more.